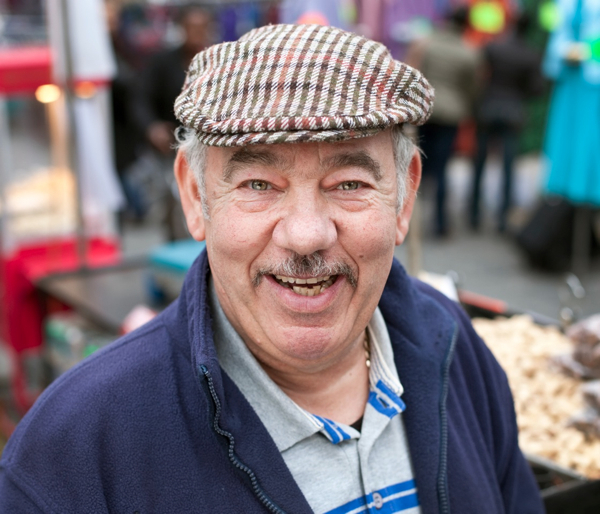 Almost as much of a familiar landmark in Spitalfields as the church or the market, Fred has been standing in his flat cap and selling chestnuts from can of hot coals on a barrow every Sunday at the corner of Bell Lane and Wentworth St for over half a century. When Fred began in the heyday of Petticoat Lane, Wentworth St was a parade of Jewish Delis, and it was this cultural identity which permitted the existence of the market when laws restricted other Sunday trading in London. “This used to be the best market in London, you couldn’t walk through it,” recalled Fred with absolute authority, his eyes focused in concentration as he stepped over to stir the peanuts that he was caramelising in a pan to one side. 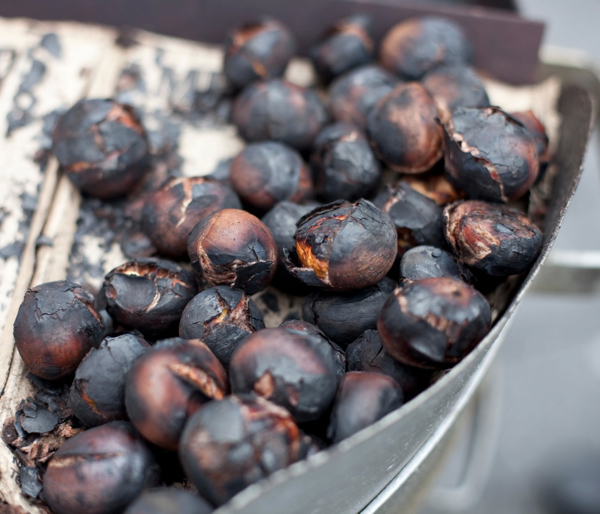 Remarkably, while the market has changed beyond all recognition around him, Fred has simply continued roasting chestnuts. “I was fourteen and a half when I started. My dad sold chestnuts and I used to go and help him up the West End - Greek St and then down in Leicester Sq – until I got a licence here about fifty years ago. I used to have a casual licence, it was so busy then you couldn’t get a pitch unless someone else didn’t turn up. I was on this corner at fifteen before I got married – my wife is English and now I’ve been married fifty years. The selling business is in the blood, my dad’s family were all chestnut sellers in Malta and my grandfather came from Sicily. King George gave the Maltese people a medal for bravery in the war. We fought the Turks. Everybody wanted a piece of Malta. My father came over here in the forties from Malta. I was born there and came to London in 1957, helping my dad. He came here to try a different life. Plumber’s Row in Whitechapel, that’s where we lived at first. It was all prostitutes in those houses in them days. I asked my dad who these ladies were. He said, ‘They’re all film stars.’ Then we moved down to live in Christian St, it was all Maltese down there. The East End was nice place to be. We used to buy our chestnuts in the Spitalfields Market, nowadays I have to go further afield. I’ve always loved selling chestnuts. I’ve been like this since I was a kid. I’ve never been to school, I just wanted to do this. This is about making your customers feel good. With this game, you’ve got to know how to go with people, otherwise don’t come in the market. My dad designed the can, after two or three years, you have to make a new one. It only takes me half an hour to get the coals hot, with some bits of wood and a spot of paraffin. I work from October until March or April, only three to four months, and as soon as I have finished my year’s stock of chestnuts, it’s over. I’ll ease up now, and I won’t come up if the weather’s bad one Sunday. I’m going to Malta next week to visit my mum and dad. He went back thirty years ago – if it wasn’t for my grandchildren and my kids, I’d move back to Malta too. But I reckon I’ll be here a few more years. As Fred spoke, a continuous stream of eager customers carried off bags of chestnuts. Many were regulars on first name terms and others were tourists that Fred seduced with repartee, inveigling his way into their holiday snaps. As well as chestnuts, Fred sells monkey nuts, freshly caramelised and roasted peanuts, plus water and soft drinks, while his son-in-law Lee fries hamburgers and hot dogs on the other side of the pitch, and Fred’s little grandson runs around excitedly in a flat cap drumming up business. Quite a drama for a street corner. I asked Fred if he likes chestnuts and he smiled. “I eat them all the time, if I start I can’t stop.” he admitted, picking up a stray chestnut and putting it in his mouth absent-mindedly. “They’re good for your cholesterol – any doctor will tell you.” he declared, chewing and nodding his head in emphatic confirmation. It is a delicious thing to buy a bag of hot chestnuts on a cold day and peel them in the street – a timeless seasonal ritual. So, as much as I long for the Spring to come, I shall miss Fred on the corner of Bell Lane when he disappears in a few weeks’ time. 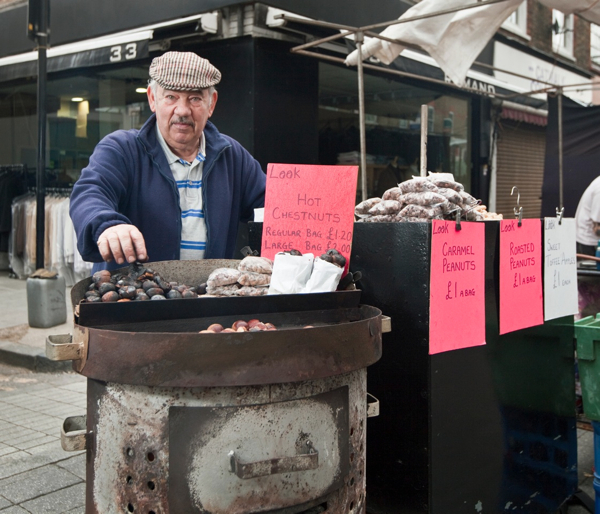 Then I shall be waiting for his return in October, with his buoyant humour, and bringing the whiff of the new season’s chestnuts from Italy roasted on hot coals, as a time-honoured harbinger of the changing year in the East End – the legendary chestnut seller of Petticoat Lane. 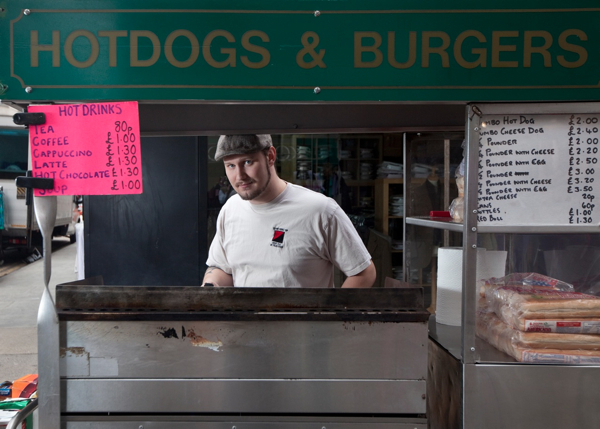 Fred’s son-in-law, Lee, a locksmith by trade, helps out with the hotdogs and burgers. Very interesting blog btw. Look forward to visiting often! 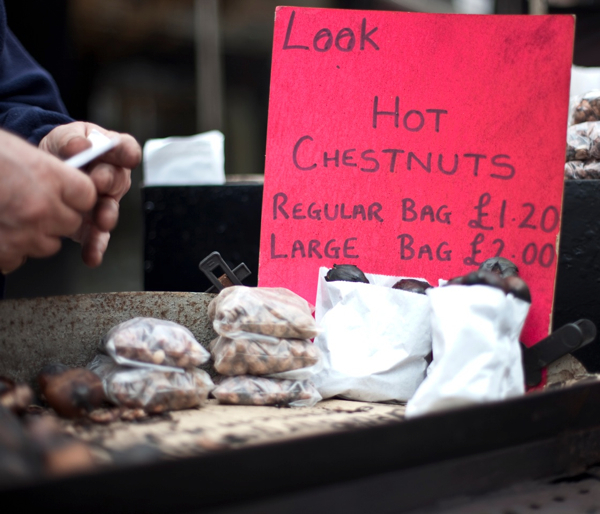 Buying chestnuts from street vendors in winter is one of the biggest things I miss now I’m no longer in London. I could eat them all day! Are you trying, gentle author, to provoke nostalgia and regret in the hearts of all those who are not in London?! I keep scrolling back to that close-up of fire-blackened chestnuts, hoping that “this time” I can somehow reach into the image, peel off the loose shell on the middle one and pop it in my mouth. The magic hasn’t worked yet, but if you ever find your photo altered, you’ll know who to blame. The smell of chestnuts, brings back so many wonderful memories as a child, my beloved dad would take me and my sister lily every Sunday morning to petticoat lane it was like an adventure, so many people all looking for a bargain, one of our favourite stops were at the apple fritter stall, hot and sweet crispy Apple dipped in batter, then we would go to the Jewish deli bakers for some cheese cake to take home, I have not been back their for over 50 years I think I just like to keep my memories as they were. can anyone help me, i am looking to buy the chestnut roaster/bin you see in the pictures anyone know where i would start to look for one.